The monthly rise in home prices has shrunk for the second straight month for the Seattle metro area. Seattle-area home prices have surged to a record for the third straight month and continue to rise faster than in all but one other major city, our West Coast neighbor Portland. But there are signs that the local housing market may be cooling down just a bit. Single-family house values rose 10.7 percent in May compared to a year ago, about the same annual growth rate as the previous three months, according to the monthly S&P/Case-Shiller index released Tuesday. That’s more than double the national average increase of 5 percent. Local home costs have now soared 55 percent since they bottomed out four years ago, and they’re up 4 percent above the old pre-recession high. The top four metro areas remained unchanged from a month ago: Portland is still leading the pack but saw its lead widen, with home prices there now up 12.5 percent in a year. That’s followed by Seattle, Denver and Dallas. Tampa overtook San Francisco this month for the fifth spot, while the smallest increases were in New York, Washington, D.C., and Cleveland. But while the annual price hike has remained steady, the big change for Seattle is what’s happened in the last month. The 1.4 percent monthly rise in home prices is down from 2.1 percent a month prior and 2.4 percent two months ago. 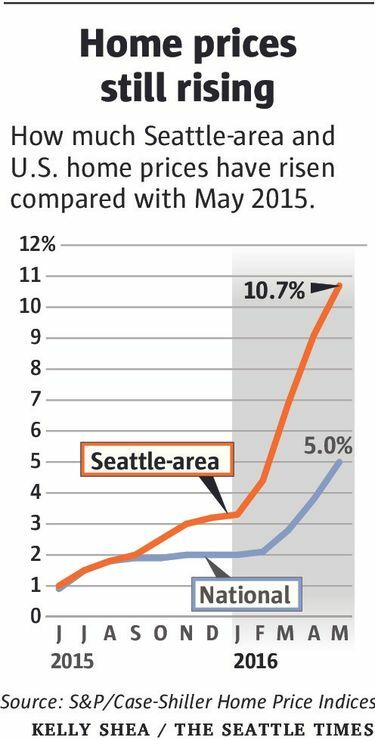 Seattle had led the nation in monthly home-price growth for two straight months. Now, it’s fallen to fourth, behind Chicago, Minneapolis and Portland. Seattle’s monthly home cost increase is now just slightly ahead of the national average, after it was double the U.S. rate the previous two months. Still, the increase was enough for Seattle to set a new all-time high for the third straight month after the region earlier this spring surpassed its previous peak from summer 2007. The index also showed Seattle reached a new benchmark indicating prices have now doubled since 2000. The Case-Shiller index, which covers King, Snohomish and Pierce counties, looks at the difference between home-sale prices today and how much that same home last sold for. But it doesn’t measure actual home prices. Across the U.S., May was the fourth straight month that home-price growth remained flat or dropped, said Trulia chief economist Ralph McLaughlin. U.S. home prices are still just a tad below their record from last decade. There isn’t any relief for renters, either. Last week the Seattle area topped the charts for the fastest-rising rent in the country for the first time this decade, up nearly 10 percent in the past year. Housing costs are soaring about four times faster than incomes across the state.